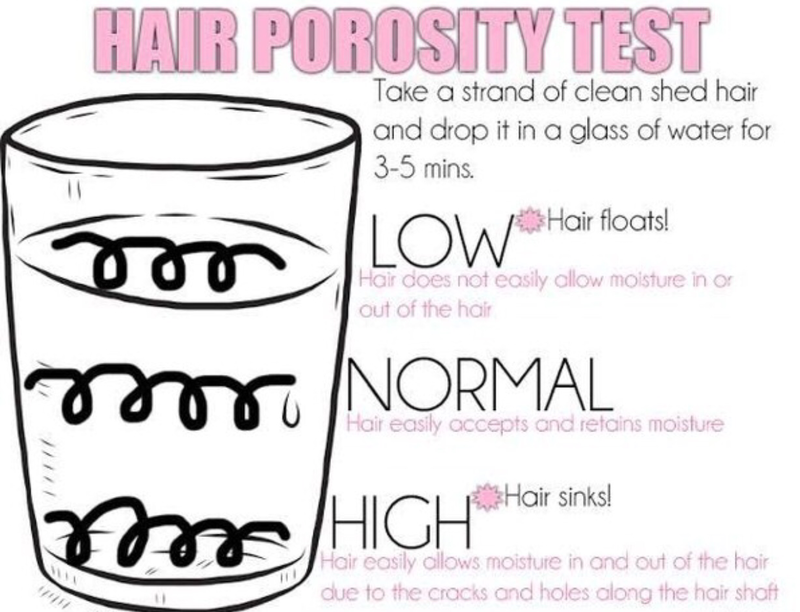 POROSITY – refers to the ability of your hair to absorb moisture and hold on it. LOW porosity hair has a hard time getting moisture in, but once it’s in, it holds on to it. MEDIUM porosity hair allows moisture in and out at a normal rate.HIGH Porosity hair allows moisture in quickly, but also loses it quickly. Caring for high porosity hair can be a challenge, but in this post I’ll share some tips that have helped me. Low Porosity – the cuticles are tightly closed and close together and it is difficult to get moisture/chemicals in. However, once moisture is in, it’s IN. Low porosity hair tends to have a hard time “getting wet” in the shower. However, once it’s wet, it takes a long time to dry. Normal Porosity – the cuticles are evenly spaced and allow moisture to pass in easily but prevents too much from entering. High Porosity – the cuticles are lifted and open. It allows lots of moisture in, but also loses it quickly. High porosity hair gets wets quickly but also dries quickly. Continuous exposure to hard water. The mineral and metal deposits in hard water cause it to have a higher pH than regular water, thereby causing the cuticles to swell and lift. Basically anything that cause cracks, spaces in the protein structure of the hair will trigger highly porous hair. Products that were pH balanced. The ideal pH of the hair is 4.5 -5.5 and products within that range helped my cuticles to lay down and retain the moisture I’d put in. Aloe Vera juice/gel (Coconut Water is great option also) is a great ingredient that helped me regulate the pH of products that were not within the ideal range. Protein treatments/Henna Glosses/Cassia Obovata treatments – these did a great job of filling in the spaces/patching up the spaces in my cuticles that caused it to be raised. My entire Ayurvedic hair regimen was very helpful in getting my hair back into shape. NOTE: Henna & Cassia are not protein, however they do mimic the action of a protein treatment. Apple Cider Vinegar rinses – ACV does an awesome job of smoothing and closing the cuticles to prevent moisture from escaping. I used about 1 Tblsp for 8oz of distilled water as a final rinse after deep conditioning. Dry/Oil detangling – After pre-pooing with Coconut Oil (most of the time), I’d detangle my hair before washing. This helped a lot in reducing breakage since my strands would become so swollen when wet that they snapped when I’d try to detangle. Frequent Deep conditioning treatments – This helped to maintain the moisture level in my hair as well as maintain the protein-moisture balance in my hair. Patience and TLC – there is no quick fix. I had to love on my hair and nurse it back to health. I’m happy to report that now it is doing much better. In my opinion, knowing and understanding your hair’s porosity is very important. As you can see, porosity will affect how you deal with your hair, what types of products/tools/techniques you use and the overall health of your hair. This is so interesting. Never would have thought about the porosity of hair. I’ve never even heard of hair porosity, so I’m going to try the test out because I’m always looking for new ways to help my hair be healthier.